I recently cloned Windows 8 with apps and data from a 500gb 5400RPM Hybrid disk to a 500gb SSD using “Paragon Migrate OS to SSD 4.0“. The process went smoothly – install Paragon’s software and connect the new SSD with a USB to SATA cable. Launch the software, pick the target disk and the cloning processes begins. Mine cloned 120gb of data in 30 minutes. The final step is to swap the drives, confirm the new SSD is the boot disk in BIOS and… you’re off to the races. Except one issue. Microsoft did not approve of using the Asus provided Windows install on a second hard drive. My freshly cloned smokin fast SSD was displaying Activation error code 0xC004C008 – “One copy of Windows might have been installed on multiple PCs“. Windows Activation wanted a serial number and I didn’t have one – Asus has mine, and it’s only embedded in the Recover Partition of my old drive. What to do?! It couldn’t have been easier – phone activation! 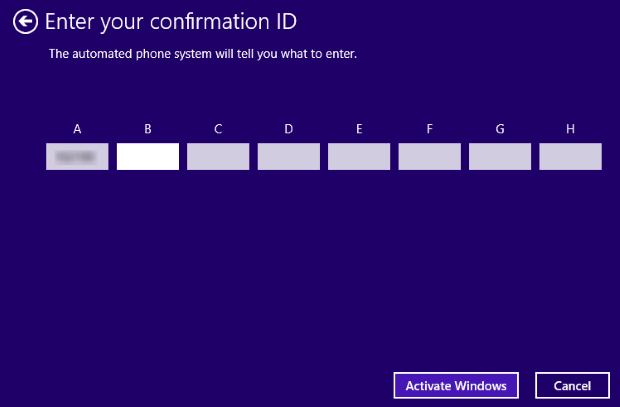 Phone Activation – this process took me less than 5 minutes, pretty cool technology. Be ready – you will be asked to read 8 sets of 4 numbers. Voice recognition is very fast, each set confirmed with a ding.